Two buildings, each three-stories with ample parking around them, house the 22 units that make up the Base 9 Condominiums. They are located one block off Highway 9, on Broken Lance Drive in quiet, residential Warriors Mark. 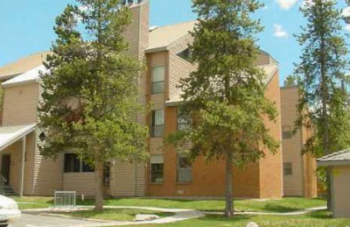 Broken Lance is on the south side of Breckenridge and is the main drive for this close-in neighborhood, and Base 9 is the first condo complex across the Blue River on the neighborhood side – not the highway side – of Warriors Mark. This puts the Base 9 condos for sale on the free, town shuttle route, and just across the street from a small loop of similar condos that all share the Columbine pool and spa. A short walk along this loop will get Base 9 residents to the south end of downtown Breckenridge, and to other walkways and trails that span the short distance between this area and the ski lifts at Peak 9. Learn more about this quiet condo complex, or discover the Base 9 condominium listings found below. Any Base 9 Condo for sale is two-bedrooms, some have a den, and all are more than a thousand square feet. All were built in the functional condo style popular in the ’70s with an open floor plan, galley kitchen with bar separating it from the living area. Several features of each unit will distinguish one from another: the end units views may be toward the Ten Mile Range or toward Baldy Mountain, while the view from others will are up and down the Blue River Valley. Decks bring the outside into the upper levels, while a patio is available on the ground floor. The larger condos have an extra 200 sq. feet of living area. Size: 1150 sq. ft to 1350 sq. ft. Amenities: Conveniently located near Highway 9, and side of Warriors Mark closest to town. Large surface parking. 127 Broken Lance Dr. Warriors Mark. Drive south on Main Street to last stoplight at Boreas Pass Road, turn right on Broken Lance Drive. Just before the three-way stop, turn left into the Base 9 parking area. Are you ready to talk to a Summit County real estate pro? You can send us a message or call us at (970) 453-2200.